The Fire Within has had an interesting journey. This was the first time I had seen a burl with alternating colours. The light creamy wood was considerably softer than the reddish brown. The first piece I made was highly textured as I did not use anything to stabilize the softer wood. On the next platter, I used clear epoxy to give the wood integrity and to fill some small gaps. 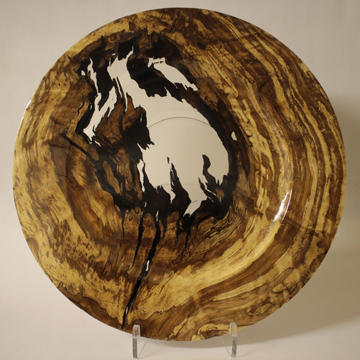 The wood for this piece came from the part of the burl that was cut from the tree. The chainsaw cut was very uneven and there was a lot of rot and missing wood in the center. I almost discarded it as being unusable, but something in this slice of burl whispered to me. I had to try a lot of new processes and ideas to move it forward. Over a period of about 6 months of nurturing it and nudging it along, I finally had something that could be put on the lathe. Turning epoxy was a new experience with quite a learning curve but once mastered, new doors were opened. This platter is the culmination of that journey and an opportunity to introduce a different voice into the conversation.